From the mid-1950s to the early '70s, the United States sent thousands of musicians around the globe to further American interests. In the program’s heyday, musicians trekked to nearly every continent, playing jazz, classical music, the blues and much more according to Danielle Fosler-Lussier, associate professor in the School of Music, as she details in her recently published book, Music in America’s Cold War Diplomacy (University of California Press, 2015). As part of her research, Fosler-Lussier created an interactive database detailing the musicians who appeared in countries throughout the world during the Cold War. Users can search geographically or by name to find that, for example, Dizzy Gillespie’s jazz band played in Argentina in the mid-1950s, the Westminster Singers performed in Libya in 1959, the Boston Symphony was in Australia in 1960, Benny Goodman entertained Russian audiences in 1962 and the Julliard String Quartet visited Poland in 1965. She said the musicians, through personal contact and media publicity, bolstered personal and political relationships on a global scale. “Not only did the program impact how the foreigners thought about America, but it also changed how the musicians themselves thought about the world,” she said. “It created a real connection between the musicians and the people of host countries. The Duquesne University Tamburitzans, a folk ensemble, was on tour in the Soviet Union in 1969 when America first landed on the moon. The Soviet people heartily congratulated the musicians and bought them champagne to celebrate the moon landing — their warmth was striking.” Nearly 50 years later, the musicians remember these moments of personal contact with equal warmth. 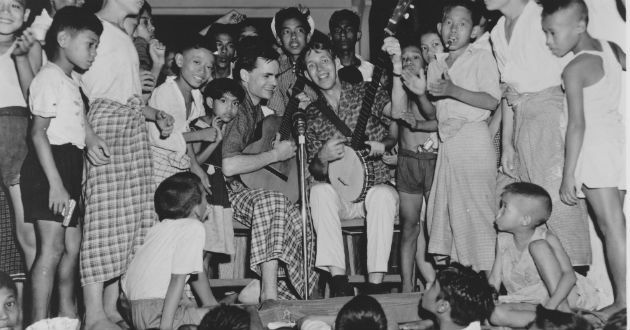 Bill Crofut and Steve Addiss, American folk singers, with children in Burma (now Myanmar). The program also gave African Americans an opportunity to shine on the world stage — and a chance to comment on race relations in America. Marian Anderson toured Asia in 1957, at the time of the Little Rock school desegregation crisis. Her concerts of classical music and spirituals were widely admired. She was also asked to talk about her experiences of discrimination as an African American. She responded with honesty and dignity, speaking frankly about the need for progress toward equality. Her answers drew acclaim from Asian journalists, and also from the American public, who saw her tour on television. Seeing African Americans as diplomats helped people both abroad and at home recognize their talent and achievements, making it seem as though racial harmony was close at hand. Fosler-Lussier said the State Department’s experiment in musical diplomacy confirmed that music was a useful tool: Music linked the U.S. government and individual participants through a common project. Musicians were willing to serve the government to enhance their own careers. The government used the attractive power of music to draw the musicians into service as representatives of the state, and to help people all over the world feel a personal connection with America. Fosler-Lussier’s book was named an Outstanding Academic Title by the American Library Association’s Choice magazine. This distinction is given to just 10 percent of the 7,000 books reviewed in Choice every year. Top-right sidebar image: Thomas Dorsey (Tom Two Arrows) with children in Dacca, Pakistan. RG59-G-95-205, National Archives. Body image: Courtesy of Danielle Fosler-Lussier.